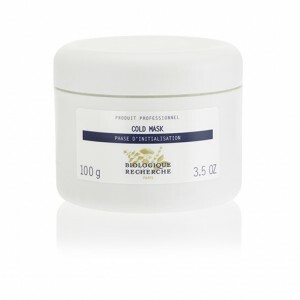 The Cold Mask is formulated with Micronised Laminaria and Diatome Powder, to gently purify, balance and regenerate the skin. An extremely refreshing and healing mask, developed to soothe, mattify, brighten and unify the complexion of the most sensitive of Skin Instants®. This masque is used on top of another masque during a treatment to enhance its penetration into the skin. It will provide an instant cooling and soothing effect to any skin in need of comfort. Seborrheic and sensitive Skin Instants®. Ideal for Skin Instants® with imperfections. Ideal for post-operative or post aesthetic skins in need of calming and regenerating. Purifying and balancing agents: Micronised Laminaria.